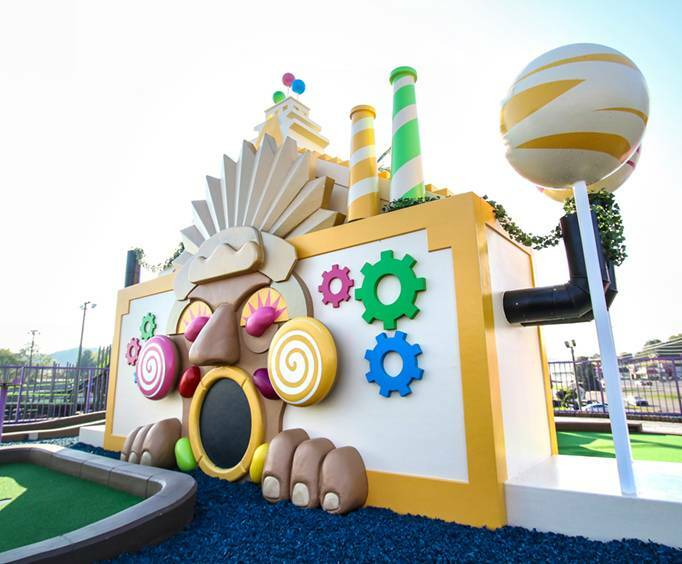 Crave Mini-Golf is one of the sweetest golf courses in the world. Head to this amazing activity center where you will feel like you are a kid again! All ages are sure to have a blast in this Wonka-style candy wonderland, so bring the whole family along with you for a fantastic activity in Gatlinburg/Pigeon Forge Area, TN. Not only is this course the best in Pigeon Forge, but it is also ranked as one of the Top 13 Mini Golf Courses in the Country. This unforgettable course is comprised of an astounding amount of features, sweets, and fun. The course itself features a 19-hole indoor course and a 19-hole rooftop course. These amazing courses are decorated with the sweetest decor. From gigantic scoops of ice cream to towering candy canes, ice cream sandwiches, and lollipops, this brightly-colored theme is sure to entrap the minds and imaginations of all who visit. 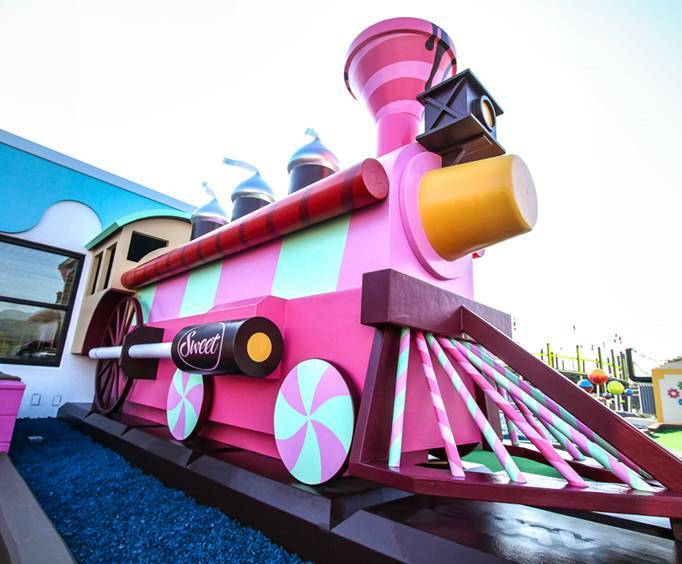 The indoor course features 19 holes in a candy theme. From ice cream canyons to cotton candy trees, guests will feel like they're a part of a delicious sugary dream. Plus, they can add a dash of spice to their sweetness at the Spin Zone which puts a new twist on the classic game of mini-golf. For even more fun, head to the roof to the astounding 19-hole course located there! This two-tiered outdoor course features challenging holes in the Crave candy theme. This mini-golf adventure is completely unique and is sure to be a highlight of your getaway. Guests will be able to get in some friendly family competition at these courses. See who can get the best score while enjoying the new memories that you'll create! Then, top it all off with a visit to the candy store to sink your teeth into the delicious treats offered. Or, purchase one of their famous gourmet milkshakes. Just a few of these unique flavors include Cocoa Cliffs, Rock Candy Mountain, Sugar Safari, and Jelly Bean Jungle. Feeling adventurous? Create your own milkshake masterpiece! 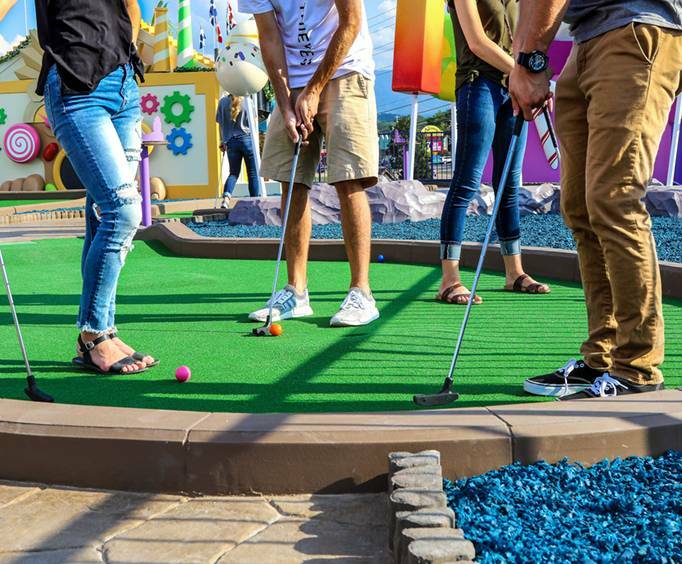 Bring the entire family for a fun day of mini-golf, milkshakes, and more at Crave Mini-Golf in Pigeon Forge, TN! What is included in the admission price for Crave Mini-Golf ? Includes two mini golf courses. Approximately how long could a customer plan to spend at Crave Mini-Golf ? There is a milkshake and candy concession stand. Is Crave Mini-Golf handicap accessible? For what ages is Crave Mini-Golf appropriate? Is parking available at Crave Mini-Golf ? Is it free?